With the NFL season kicking off in a month, we’ll take an early look at some DraftKings and FanDuel salaries, provide some insights, and review some DFS value players for week 1 of the 2018 NFL season. Salary ranks are based on the main-slate Sunday only (12 games). Of course, anything can happen in the next month, so updates will be made as new info comes to light prior to Sunday kickoff. 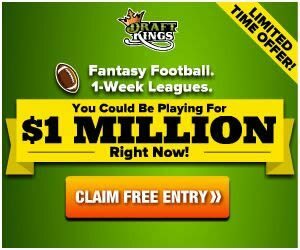 Case Keenum (DEN) – Salaries: DraftKings (DK) – 5100, FanDuel (FD) – 6300. Keenum’s upcoming salary ranks him 21st/20th on DK/FD, respectively for the position. The betting lines with the Seahawks has the game total at 42 points (second lowest on the board) with the Broncos as -2.5 point home favorites. The Seahawks ‘ implied team total is currently at 19.75 points and the Broncos are currently at 22.25 points. Last seasons defensive stats for Seattle will now largely be irrelevant heading into the 2018 season, as a mass exodus of starters including DE Michael Bennett, DT Sheldon Richardson, S Kam Chancellor, and CB Richard Sherman are now gone. S Earl Thomas has yet to report to camp, and if he were to miss week 1 for any reason, this would be a huge boon to Denver’s offense. Keenum, with Minnesota last season, ranked 12th in passing yards and passing TDs, 7th in passer rating at 98.3, and finished with an efficient 22:7 TD:INT ratio. His aerial weapons in Denver are a downgrade from last year, but he is a big upgrade compared to what Denver threw under center last season. The defensive matchup for Keenum is not imposing, as the Legion of Boom is no longer. He has a decent shot to outperform his salary rankings for week 1. Thomas has finally reported to the team. The disgruntled safety should see the field come Sunday barring more drama. Tyrod Taylor (CLE) – Salaries: DraftKings (DK) – 5400, FanDuel (FD) – 6600. Taylor’s upcoming salary ranks him 18th/16th on DK/FD, respectively for the position. The betting lines with the Steelers has the game total at 46.5 points with the Browns as +6 point home dogs. The Browns’ implied team total is currently at 20.25 points and the Steelers are currently at 26.25 points. Last season, the Steelers ranked 9th in fantasy points allowed to QBs and 7th in DVOA against the pass. The Steelers also ranked 5th in pass yards allowed with 201.1/gm and 7th in points allowed with 19.3/gm. The defensive matchup will be tough, but Cleveland’s offensive upgrades this season are substantial. Along with the addition of Tygod, the offense added WR Jarvis Landry and RB Carlos Hyde. They also added 2nd round G Austin Corbett and 4th round WR Antonio Callaway, both of whom are expected to start. WR Josh Gordon has yet to report to camp, but he should be available for week 1. Taylor ranked 3rd in QB rushing yards with 427 in 15 games along with 4 rushing TDs, so he always brings a duel threat. As +6 point dogs, the negative game script may have Taylor airing it out, especially if the Browns are down early. As long as Gordon’s week 1 availability is a non-issue, Taylor’s efficient play along with the best weapons he’s had in his career, Taylor could outperform his salary ranking, for a cheap price. Blake Bortles (JAX) – Salaries: DraftKings (DK) – 5600, FanDuel (FD) – 6600. Bortles’ upcoming salary ranks him 14th/17th on DK/FD, respectively for the position. The betting lines with the Giants has the game total at 43.5 points with the Jaguars as -3.5 point road favorites. The Jaguars ‘ implied team total is currently at 23.5 points and the Giants are currently at 20 points. Last season, the Giants ranked last in fantasy points allowed to QBs and 19th in DVOA against the pass. The Giants also ranked 31st in pass yards allowed with 252.4/gm and 27th in points allowed with 24.3/gm. QB Fantasy points: 13th, passing yards: 11th, passing TDs: 16th, INTs: 7th most (tied w/ 5 others) QB rush yards: 7th, Red Zone pass TDs: 6th (tied). Offensive off-season transactions had WRs Allen Robinson and Allen Hurns leaving, with WR Donte Moncrief and TE Austin Seferian-Jenkins joining the team. As a run-first team, the passing offense may roughly be what it was last season, with a nice matchup against a below-average secondary. LB Olivier Vernon (ankle) has been ruled out. A bad Giants defense will be without their best pass rusher in week 1. 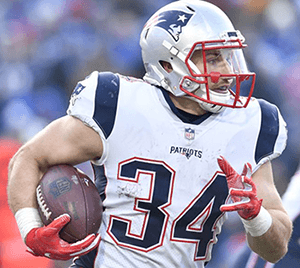 Rex Burkhead (NE) – Salaries: DraftKings (DK) – 4200, FanDuel (FD) – 6300. Burkhead’s upcoming salary ranks him 42nd/19th on DK/FD, respectively, making him a much better relative value on DK. The betting lines with the Texans has the game total at 51 points (highest on the board) with the Patriots as -6.5 point home favorites. The Patriots’ implied team total is currently at 28.75 points and the Texans are currently at 22.25 points. Last season, the Texans ranked 13th in fantasy points allowed to RBs and 12th in DVOA against the run. The Texans also ranked 13th in rush yards allowed with 109.2/gm and last in points allowed with 27.3/gm. The Texans defense went through their fair share of injuries last season, but most notably the return of DE J.J. Watt will be a big boost. Houston’s run defense should be solid this season but the pass defense is a liability, an area where the Patriots are obviously strong, even without Julien Edelman. Last season, the Patriots ranked 10th in rush yards with 118.1/gm and ranked 2nd in points scored with 28.6/gm. Burkhead, who is currently listed as the starter, should handle early down and goal line work. The Patriots spent a 1st round pick on RB Sony Michel, but he has already had his knee drained during camp, and his role, if any, heading into week 1 is currently uncertain. In 10 games last season, Burkhead had 5 rushing TDs, with 6 going to the now departed Dion Lewis, and 5 going to Mike Gillislee, who may be on the roster bubble with the additions of Michel and Jeremy Hill. Burkhead and Lewis also added 3 receiving TDs apiece last season. Burkhead should have opportunities to score if New England can get him near the goal-line. Burkhead has a slight knee tear but it is currently deemed to be minor. OT Isaiah Wynn tore his Achilles and will miss the season. Duke Johnson Jr. (CLE) – Salaries: DraftKings (DK) – 4700, FanDuel (FD) – 5800. Johnson’s upcoming salary ranks him 28th/30th on DK/FD, respectively for the position. The betting lines with the Steelers has the game total at 46.5 points with the Browns as +5.5 point home dogs. The Browns’ implied team total is currently at 20.5 points and the Steelers are currently at 26 points. Last season, the Steelers ranked 18th in fantasy points allowed to RBs, 18th in DVOA against the run, and 23rd in DVOA against RBs in the pass game. The Steelers also ranked 10th in rush yards allowed with 105.8/gm and 7th in points allowed with 19.3/gm. Last season, Duke’s receiving line of 93/74/693/3 (targets/catches/ yards/TDs) respectively ranked him 4th/4th/3rd/6th (tied) amongst all RBs. This same line also ranked him 1st/1st/1st/2nd on his own team for all positions. Duke’s 4 rushing TDs also led all Cleveland RBs. For reference, LeSean McCoy’s receiving line last season of 77/59/448/2 ranked him 8th/7th/9th/14th (tied) amongst all RBs. With Isaiah Crowell gone, Cleveland brought in RBs Carlos Hyde and 1st round rookie Nick Chubb. However, Duke’s passing situation role should be secure. Pittsburgh’s defense is strong against the pass, especially against TEs where they ranked 4th in fantasy points allowed and 1st in DVOA to the position. This should eliminate TE David Njoku from the equation as major contributor in this matchup. In Njoku’s lone appearance against Pittsburgh last year (albeit week 17), he recorded 2 catches for 38 yards. A recent development occurred where rookie WR Antonio Callaway had been cited for marijuana possession, leaving his status for week 1 uncertain. Just after this incident, the Browns traded WR Corey Coleman to the Bills for essentially a slice of pizza. Duke’s week 1 role should be interesting, especially if the implied negative game-script holds. He would make an intriguing stack option with Tyrod. John Ross (CIN) – Salaries: DraftKings (DK) – 3900, FanDuel (FD) – 5100. Ross’ upcoming salary ranks him 50th/56th on DK/FD, respectively for the position. The betting lines with the Colts has the game total at 46.5 points with the Bengals as +3 point road dogs. The Bengals’ implied team total is currently at 21.75 points and the Colts are currently at 24.75 points. Last season, the Colts ranked 28th in fantasy points allowed to WRs and last in DVOA against the pass. The Colts also ranked 28th in pass yards allowed with 246.6/gm and 30th in points allowed with 25.3/gm. Ross, the NFL’s fastest man, essentially missed his rookie season due to injury. He is currently projected as the Bengals’ WR2. Along with the implied negative game-script, ideal matchup indoors against perhaps the NFL’s worst pass defense, Ross is a cheap option worth a flier if lightning happens to strike. Tyler Lockett (SEA) – Salaries: DraftKings (DK) – 4300, FanDuel (FD) – 5600. Lockett’s upcoming salary ranks him 39th/42nd on DK/FD, respectively for the position. The betting lines with the Broncos has the game total at 42 points with the Seahawks as +2.5 point road dogs. The Seahawks’ implied team total is currently at 19.75 points and the Broncos are currently at 22.25 points. The Broncos defense ranked 4th in fantasy points allowed to WRs and 15th in DVOA against the pass. The Broncos also ranked 4th in pass yards allowed with 200.6/gm and 22nd in points allowed with 23.9/gm. However, CB Aqib Talib has left for the Rams. Lockett steps in as the projected WR2 this season. The departures of WR Paul Richardson Jr. and TEs Jimmy Graham and Luke Willson, leaves a combined 200 targets, 116 catches, 1,376 yards, and 20 TDs now vacant. The targets, catches, and yards are roughly 35% of last year’s team total and the vacated TDs accounts for over 58% of the team’s receiving total. WR1 Doug Baldwin should matchup up against Chris Harris Jr. a good deal of the time, leaving Lockett potentially available for a volume spike right out of the gate. Cameron Meredith (NO) – Salaries: DraftKings (DK) – 4400, FanDuel (FD) – 5600. Meredith’s upcoming salary ranks him 38th/18th on DK/FD, respectively for the position, making him a much better relative value on DK. The betting lines with the Bucs has the game total at 49.5 points (2nd highest on the board) with the Saints as -9.5 point (widest on the board) home favorites. The Saints’ implied team total is currently at 29.5 points and the Bucs are currently at 20 points. Last season, Tampa Bay’s defense ranked 30th in fantasy points allowed to WRs and 31st in DVOA against the pass. The Bucs also ranked last in pass yards allowed with 260.6/gm and 22nd in points allowed with 23.9/gm. Meredith missed last season with a torn ACL, but joins his new team as the projected slot receiver. In Meredith’s 2016 season, he was the top WR in Chicago with a total receiving line of 96/66/888/4 which led Chicago’s WRs in all categories. And this was with Matt Barkley, Brian Hoyer, and Jay Cutler as his QBs. The departures of WRs Brandon Coleman and Willie Snead and TE Coby Fleener, opens up a combined 84 targets, 53 catches, 751 yards, and 5 TDs. Meredith could end up ranking 3rd on the team in targets and catches for the season, behind only Michael Thomas and Alvin Kamara. Although Tampa Bay’s defensive line is much improved from last season, the secondary remains a dumpster fire, where Drew Brees and company should have zero issues lighting them up. Meredith is inactive. Other cheap pivots are Keelan Cole and Bruce Ellington. Third round rookie WR Tre’Quan Smith has shown well in preseason. There is potential for him to mix in with Ginn and Meredith at some point. Vance McDonald (PIT) – Salaries: DraftKings (DK) – 3200, FanDuel (FD) – 4800. McDonald’s upcoming salary ranks him 15th/18th on DK/FD, respectively for the position. The betting lines with the Browns has the game total at 46.5 points with the Steelers as -5.5 point road favorites. The Steelers’ implied team total is currently at 26 points and the Browns are currently at 20.5 points. Last season, the Browns ranked 29th in fantasy points allowed to TEs and last in DVOA against the position. McDonald is the projected starter heading into the season. In last season’s divisional round loss to Jacksonville, McDonald posted a line of 10-112-0 on a team high 16 targets. McDonald’s matchup is ideal and his price is nice. McDonald (foot) has been ruled out for week 1. Jesse James will fill in for him. Austin Seferian-Jenkins (JAX) – Salaries: DraftKings (DK) – 3200, FanDuel (FD) – 4600. ASJ’s upcoming salary ranks him 15th/26th on DK/FD, respectively for the position, making him a much better relative value on FD. Last season, the Giants ranked last in fantasy points allowed to TEs and 15th in DVOA against the position. ASJ joins his new team as the projected starter. ASJ’s receiving line of 74/50/357/3 with the Jets ranked 3rd across the board for all Jets receivers last season. The matchup is great and his price is cheap. Tyler Eifert (CIN) – Salaries: DraftKings (DK) – 3400, FanDuel (FD) – 5500. ASJ’s upcoming salary ranks him 11th/9th on DK/FD, respectively for the position. Last season, the Colts ranked 21st in fantasy points allowed to TEs and 23rd in DVOA against the position. Eifert’s injury issues are infamous by now, as he’s appeared in just 10 games over the past two seasons. But when Eifert is healthy and on the field, he is a red zone and TD machine. As of now, he’s supposedly healthy and projected to start, so if there’s ever a time to go with Eifert, now would be it.